Would You Like to Start A Community Shop? The Retail Community Retail Project will be taking a close look at the very successful Plunkett Foundation Module detailed below. As the Irish module is developed, this page will be updated. The Plunkett Foundation has been helping rural communities through co-operatives and community-ownership to take control of the issues affecting them since 1919. Championing and connecting rural co-operatives internationally. Their charitable purpose is the alleviation of poverty and social exclusion in rural communities both nationally and internationally through the promotion and support of co-operatives and social enterprises . The Plunkett Foundation is a organisation based in Oxfordshire, England. Visit The Plunkett Foundation Website for a wealth of information and inspiration. 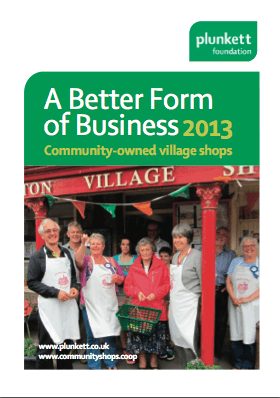 Read their Better Business Report here or by clicking on the report icon at left.